Motivated employees, members and even students can be a major factor in the success and performance of any organisation, therefore it is important that managers, coaches and teachers understand the power of reward systems and how they can be used to influence and enhance individual behaviour. A strategic reward system is important for motivation, recognition and appreciation, it gives that extra touch to the management-employee / student relationship and helps gain trust and longevity towards the organisation. Bespoke presentation medals and coins make individuals feel like winners! It gives them something physical to remember their hard work and achievements and also is a lovely momentum to show off to their co-workers, friends and family of course. Achievement and Award Badges are a wonderful way to celebrate success and long service or contributions from individuals. 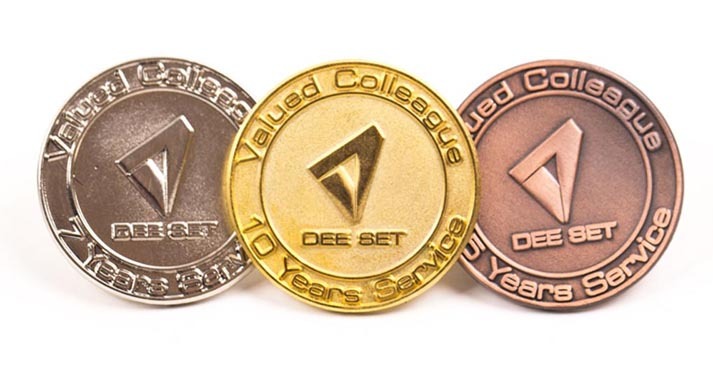 Award Badges can come in various sizes and finishes customised with your logo. The customisation helps to distinguish between different levels of achievement and helps individuals aim for the next level. Exciting incentives such as gift vouchers, movie tickets, shopping vouchers etc will not only lift spirits, but also motivate individuals to work harder. Extra holidays for employees in particular with long service years motivates them to continue working harder and provide continued loyalty to the company. Offering flexible working hours to employees gives them more work-life balance, greater job satisfaction and improves their performance. If you are looking for ideas to reward employees, members or students, look no further, we can help create bespoke badges and medals for you. Get in contact with i4c Publicity Ltd on 024 7666 744 or email us for a FREE no-obligation quote. We are one of the leading manufacturing personalised award badges and award medals since 2000. We have been supplying a range of clients in the education, charity, corporate, private and public sectors. We can also offer various fittings for award badges such as Brooch Fitting, Clutch pin fitting, Stick pin fitting, Magnetic badges, Adhesive backing, key chain fitting, tie slides, cufflinks / T-Bar fitting etc. Our most popular custom Medals are the bronze, silver and gold range customised with your logo or the long service Award Medals.